Protect your hair color with a new sulfate free shampoo. 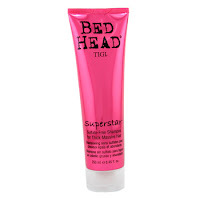 Bed Head Superstar contains oils for strengthening dull hair. It also gives a shinny look and moderate volume. Bed Head Superstar Sulfate-Free Shampoo smells yummy, like strawberry yoghurt. It’s recommended for all hair type so, it’s not aggressive with your hair.